I posted this eggnog photo on Instagram last week, just as I tucked a jar into the refrigerator. 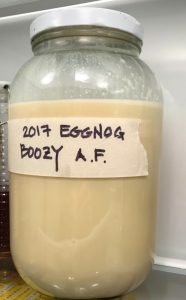 This 12-month Eggnog (that has never lasted more than 8 weeks) is such an indulgence. It’s fattening and naughty and a big punch of alcohol. There’s nothing virtuous about it. I first found the recipe on the now (sadly) defunct blog, The Bitten Word. Zach and Clay even included a video chronicling the tasting of the 12-month-eggnog, just in case it killed them. It didn’t. I was intrigued and I vowed to age some. But darn it, we drank it instead. Since that first year, eggnogging is a ritual that kicks off the season. Don’t break the bank on the booze. I used Old Forrester bourbon (on sale); bottom shelf, off-brand spiced rum, and the last of a very dodgy brandy that I’d used in a recipe earlier this year. Do use the most glorious eggs you can get your hands on. And very very good milk. Make your eggnog this weekend. You can taste it after everyone leaves next Sunday, and then enjoy it right through the holidays. Or tuck it into the back of the spare refrigerator, labeled and dated, and enjoy a mellower, silkier version next year. Packed with some slices of gingerbread, a pint of eggnog is a welcome offering to dinner party hosts. PS You’ll have a dozen egg whites leftover. Whip them for the topping on a punchbowl of eggnog, along with a cloud of whipped cream, if you do that sort of thing. Or use them to make marshmallows or for a meringue topper for your Thanksgiving pumpkin pie. Egg whites freeze well, too. You’ll need a large glass jar with a tight lid, or reuse the liquor and milk bottles. With a balloon whisk in a large, deep bowl, beat the yolks, sugar, and salt until pale creamy yellow, with a silky texture. (Yes, you can use your stand mixer for this.) Add the cream and milk and whisk until fully combined. Add the bourbon, rum, and brandy, stir or shake well, secure the lid, and refrigerate. Allow the mixture to mellow for at least one week and potentially one year. nuts and bolts. and a cookie giveaway.